Even though these aren’t tiny I thought you’d enjoy these awesome train homes. To me it’s always interesting and fun to see something old still being used especially in such a beautiful way like this. 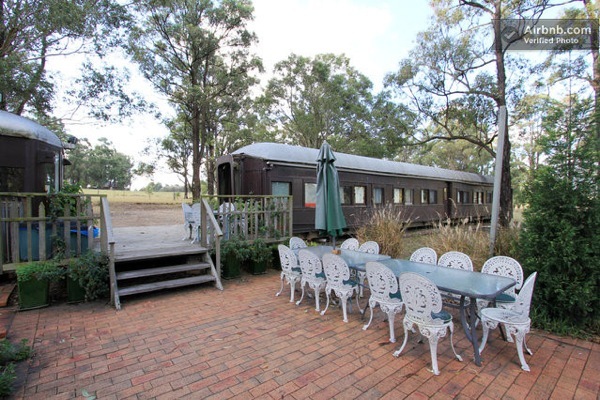 These are currently used as a pretty pricey vacation spot and as you can tell from the photos you can actually sleep up to 12 people between the two trains. Seems like people have been using them for marriages and other events too. I can see it being a really fun place to have a family gathering. But this also serves as a great example of what we can do with things that already exist. For more photos and info or to check availability in case you wanted to vacation here click here. If you enjoyed how these trains were reclaimed and converted into housing you’ll probably love our free daily tiny house newsletter with more awesome and unique housing ideas like this!